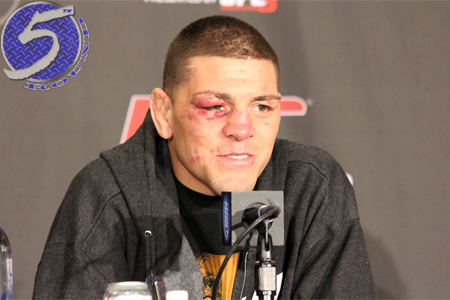 Despite having lost two straight scraps – both of which were for the UFC welterweight title – and not appearing inside the octagon in 22 months when his highly-anticipated shootout with Anderson Silva goes down, UFC president Dana White claims Nick Diaz (pictured) is just one victory over a certain “Spider” away from earning another championship affair. “Absolutely,” White responded on SportsCenter when asked if Diaz could get next dibs at the middleweight belt by beating Silva, who is coming back from one of the most horrific injuries MMA has ever seen. “You know Nick Diaz is a very popular fighter as it is. If he comes in and beats Anderson Silva, absolutely, he could fight for the title. If Diaz beats Silva on January 31 at UFC 183 to score a crack at the crown, it would clearly be based more off the “needle-mover” factor White previously said Diaz possessed than what his recent résumé shows. Should a win over a 39-year-old Silva, who is coming off what will be a 13-month hiatus after snapping his shin in half and riding a two-fight skid warrant top contender status? Based off White’s response and the fact the UFC is in desperate need of additional star power, the answer is plastered all over the cage wall.